Make sure to check out this post for my charm square giveaway. 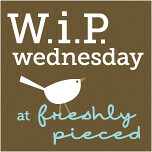 I haven't participated in Lee's WIP Wednesday over at Freshly Pieced for quite a while. I just haven't had much to show because I wasn't working on any WIP. After finishing my monochromatic quilt for the Project Modern Challenge, I decided to pull my Innocent Crush diamond quilt out of the box. I have a love/hate relationship with this quilt. I really love how it's coming out, but It's driving me crazy. Diamonds aren't for the weak. I have used my seam ripper on this quilt more than any other quilt I've ever made. I am so close to finishing this top. I'm looking forward to quilting it. I think this quilt top will get diamonds out of my system for quite some time. No new diamond projects. I have about 7 more rows to sew together and a thin border to add. Then it's officially done, and I can start thinking about the back. My only other WIP is my HST quilt that has been sitting in the box for quite a while. It will probably sit for another month or two. 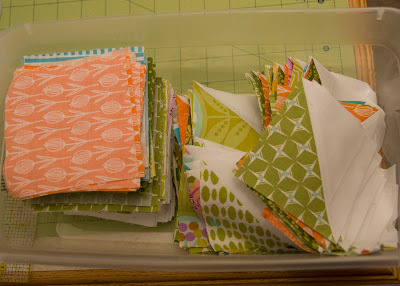 I don't count my quilt for Lynne's quilt along since I haven't started sewing anything yet. I have vowed to finished the diamond quilt top before I start anything else. I need to get it off the wall. Finally, not exactly a WIP, especially since I put it in the mail yesterday, but I wanted to share my block for Elizabeth's quilt for our bee. Her quilt is going to look amazing with all of these blocks. I'm half tempted to make one of my own. Head over to Freshly Pieced and check out the other blogs that linked up. Have a great Wednesday! That diamond quilt will be well worth the agonizing un-sweing. :) It is gorgeous. "Diamonds aren't for the weak." I love that, I'll definitely keep it in mind. 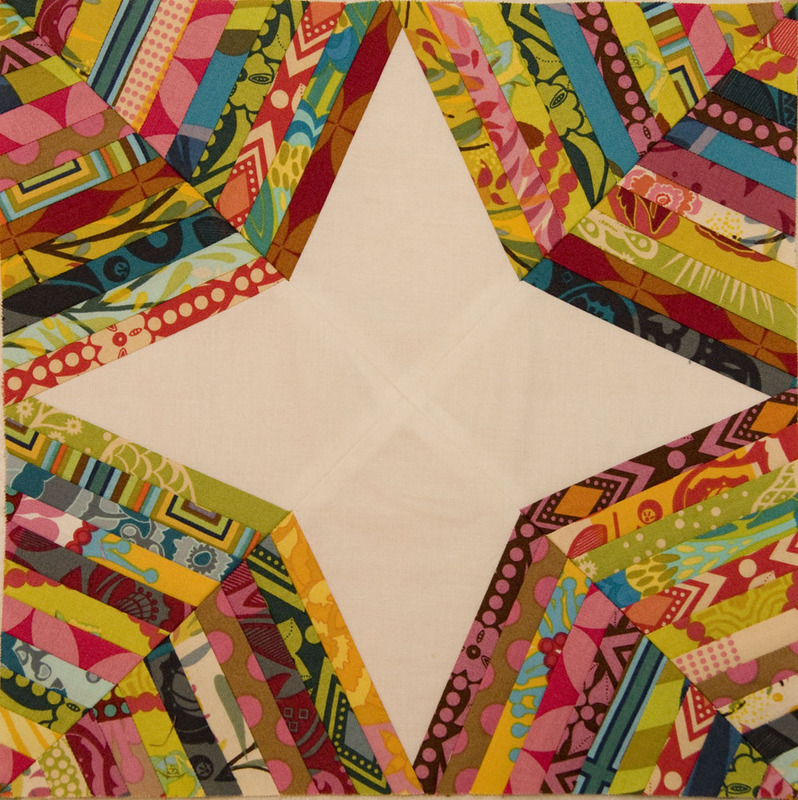 : ) I adore your diamond quilt, so I still think I'm going to have make one at some point! Thanks for linking up, have a great week. Diamonds certainly aren't for the weak, but they sure do look nice in your quilt!! Those diamonds are fantastic! 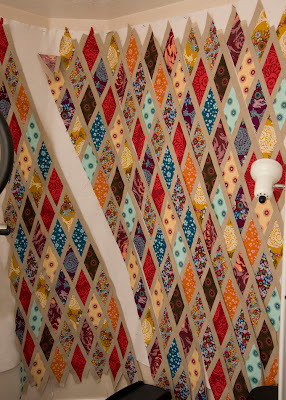 that is definitely a headache inducing quilt! Keep going with the diamonds quilt because it will be spectacular when you have finished. I made one so I do know the amount of work that goes in to them! I'm working on a diamond quilt right now too! Yours looks awesome and you're so close to finishing! Keep going! Wow, I love that diamond quilt. I cannot imagine trying to complete something so complex...at least not yet. It's amazing! In this case diamonds really are a girl's best friend, it is just gorgeous! Your diamond quilt is going to look fantastic! The diamond quilt is looking a-mazing!!! I've only made one true diamond quilt and gave it away so another will have to be in my future some day. Your quilt is so fabulous. Weekend Sewing and a Giveaway Winner!